Hello world, Betty Foxx, feisty senior sidekick here. 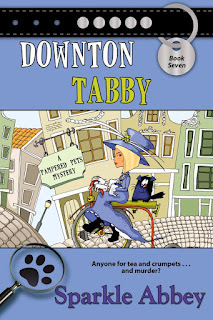 I offered to stop by today since book seven, Downton Tabby, is on sale for $1.99 on all eBook platforms. See, I helped Carol (you know her as Caro Lamont) and Detective Hottie catch a killer. I can’t spill all the details, but I can tell you I employed great sleuthing skills—including my own version of surveillance. Take it from me; people pay no attention to little old ladies hiding in shrubbery. It all started when Carol tripped over a dead body, missing our first official pet behavior appointment for my Saint Bernard, Raider. Well, I could tell by the way she didn’t want to get involved in solving the murder that I would have to be the one to help the police. Don’t know why she wanted to keep her nose out of it since it was her business associate who’d bit the dust. Carol assured me the police would handle it, but it wasn’t long before I caught that sneaky news report, Callum MacAvoy, trying to squeeze information from poor Carol. I stepped in to rescue her, but she seemed put out to have my help. Anyway, that must have been the nudge Carol needed, she was collecting suspects and throwing them under the bus to Detective Hottie. You can read how it ended for yourself. I have to get back to my newest case, the Laguna Bash ‘n Dash break-ins. For now, no one has been hurt, but in my experience, it won’t be long for someone ends up dead. Is Cash the killer or has he been kidnapped? What's up with the angry next door neighbor? And what about Cash's girlfriend, Heidi, who isn't sharing everything she knows with homicide detective Judd Malone? Add in a stranger in a dark SUV stalking Caro, feisty senior sidekick, Betty, hiding in restaurant shrubbery, and wannabe investigative reporter Callum MacAvoy who seems to be constantly underfoot, and you've got a cat and mouse mystery of the first order. 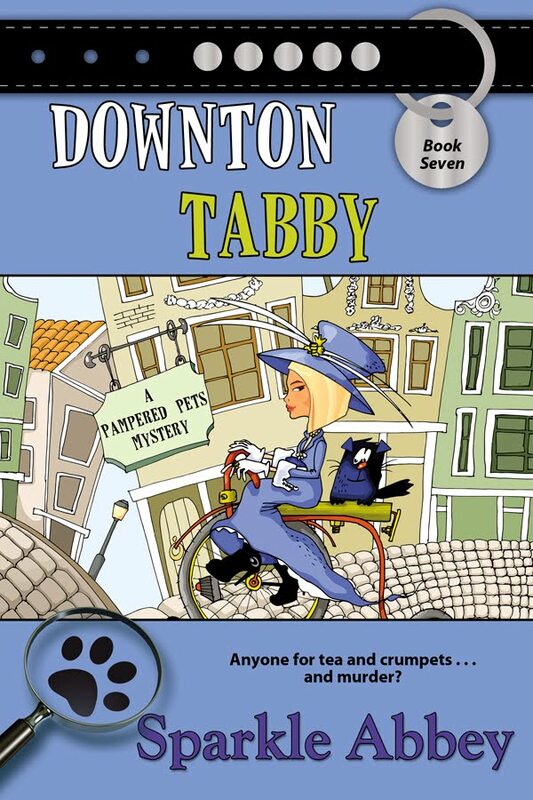 The authors wanted me to mention that their publisher is running a special on book 7, Downton Tabby and it is $1.99 in all ebook formats until June 15th. Betty sounds like quite a character.